This is very common interview question asked to warm up the interview session specially recursive approach. This problem can be solved in many ways , we will discuss iterative way first followed by recursive approach. 1. Using normal looping and outcome string holder : It is simplest approach for string reversal . store each character in temporary string holder(outcome string holder. we have used StringBuffer(A mutable sister of String) for storing the reversed string. 2. In-place reversal without using extra string holder : In this approach we will stick to normal looping but we will not use any extra string holder. Instead we use some temporary variable to store char and indexes wile iterating. For swapping of char we are using stringBuffer's method to set the char value at specified index. 3. Using XOR operation : It is really tricky one, I admit it. Before going into delve it is worth to understand the basic concept behind it XOR swapping algorithm.Now using XOR swap algorithm we will solve this problem. Algorithm : Loop input string with two index start and end, until start is less than end. 4.Using recursion: It is most commonly asked approach in an interview. How it is working ? : lets take input string as "java"
When first time control comes inside loop , since "java" is not null so if block is not executed. 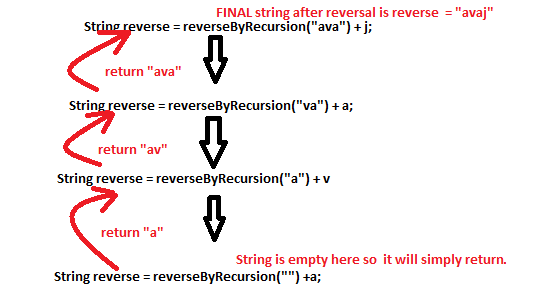 so it comes in else block, under else String reverse = reverseByRecursion(str.substring(1)) + str.charAt(0); changes to String reverse = reverseByRecursion("ava") + j, Diagrammatically have shown below the recursive call and how it concludes in upward direction. Finally reverse is returned to caller of this method as "avaj" and this concludes various string reversal approaches.